From Thursday, Jan. 31 to Sunday, Feb. 3, Cathedral Prep and Villa Maria Academy performed their winter musical, Mamma Mia, at the H. David Bowes Auditorium. Over the past several years with the help of director, Father Mike DeMartinis, Prep and Villa have built a very well-known and respected theater program throughout the Erie area. The program is known for introducing shows recently previewed on Broadway that people know and want to see, such as this year’s show, Mamma Mia. Mamma Mia was the second musical put on this school year by the Music, Visual & Performing Arts (MVP) Programs within Prep and Villa, and it was a huge hit. The Broadway show is one of the most highly recognized musicals on Broadway, as it is inspired by the very well known music of ABBA. It’s first Broadway performance was in 2000, and performance rights just became available to the public, as it was on Broadway all the way until 2015. Mamma Mia is a very fun show that attracts people of all ages. The fun music, energetic dancing, and interesting plot catches the attention of many. The Greek island in which the play takes place is always happy as it is full of sunshine, cheer, and love. 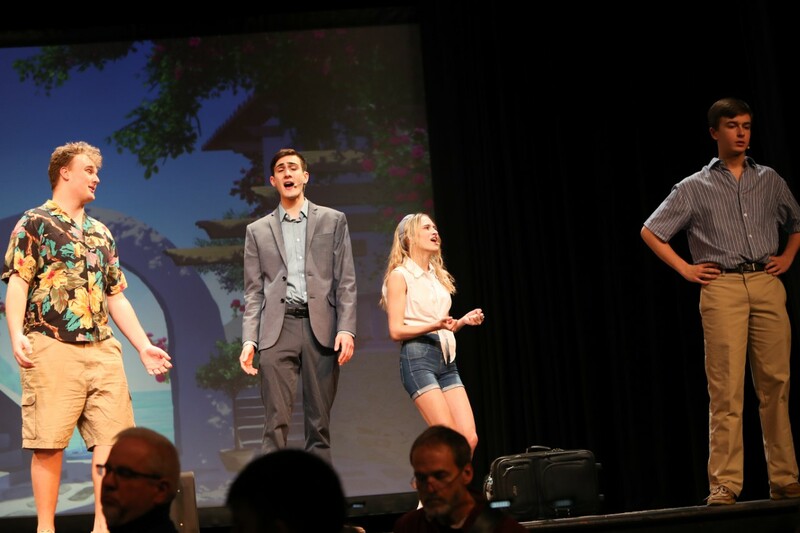 This musical is a fan favorite, as it reminds people of vacation and better times. Matt DeMarco, a Cathedral Prep senior, went to the show on Saturday night and expressed, “It was an outstanding performance and a truly spectacular musical.” While Matt is not always a huge fan of theater, he thoroughly enjoyed all that was included in Mamma Mia, and he can’t wait to see what the MVP program can do for the spring show. The show was a great success thanks to the countless hours put forth by the cast, orchestra, stage crew, and faculty directors. Nearly 100 students came together to form the cast and stage crew of this show and put on an outstanding performance. There were a total of four performances for the general public, and they combined to sell over 2,000 tickets. The Saturday night show was the largest crowd with a sold out performance of over 700 people. The auditorium was so packed on Saturday night and every seat was filled to the point where a few spectators were forced to sit up in the balcony. The students at both Cathedral Prep and Villa Maria Academy had a lot of fun preparing for the musical as it is very upbeat and modern. Ryan Sweny, a member of the ensemble, is new to the theater program this year. Ryan said, “It was a lot of fun, and I can’t wait for Newsies in the spring.” He wishes that he would’ve become involved in the MVP program before his senior year and encourages all underclassmen to give it a shot. Overall the theater program at Cathedral Prep and Villa Maria Academy continues to thrive with every show and proves that it is one of the best. Mamma Mia was a huge success and very enjoyable to watch thanks to the spectacular singing and dancing. This spring Prep and Villa will be performing Newsies, and the general public expects great things.